We've been having a streak of good weather in Vancouver lately. Blue sky, light breeze, 20-ish temperature; all the complains of gloomy cold wet weather in early summer were gone. On days like these, it is very hard to keep working in the office. All you think about is to get through the week as quickly as possible so as to enjoy the weekends outdoor. This is also not the good time to sit in front of the computer retouching pictures and composing blog posts. Yes, I admit that I'm a little slow in updating my post. But, in times when I'm not blogging, in between working and golfing, I'm still actively seeking inspiration for photography, trying out new recipes and thinking about what to eat and what to post. Back to food. Does hot summer and spicy hot food go together? Yes, it does. Especially when it is accompanied with a refreshing cold fruity drinks. 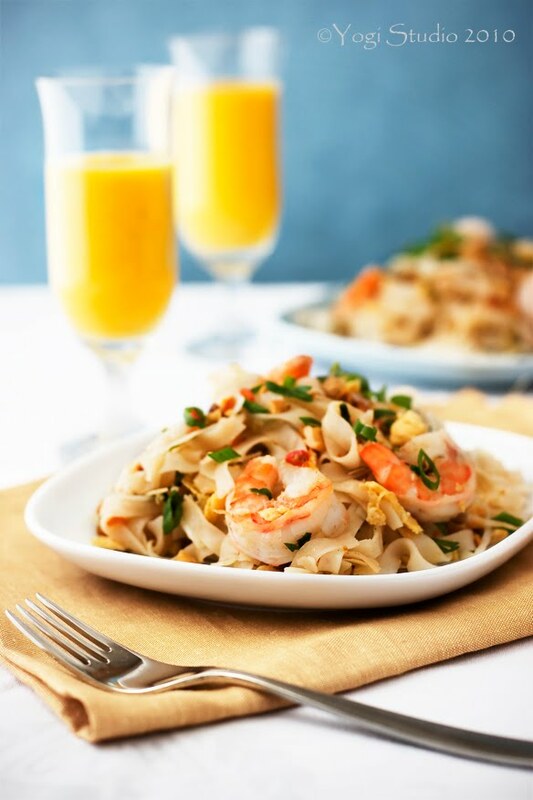 Pad thai is probably the most popular Thai dish other than Thai curry. I love the sweetness, sourness and spiciness, all come together to form a complex yet balanced flavor. Don't be scare by the long list of ingredients. It does take a while (around 40mins including time spent on roasting peanuts) to prep all the ingredients. But once you have all the prep work done, the actual cooking time takes about 10mins only. 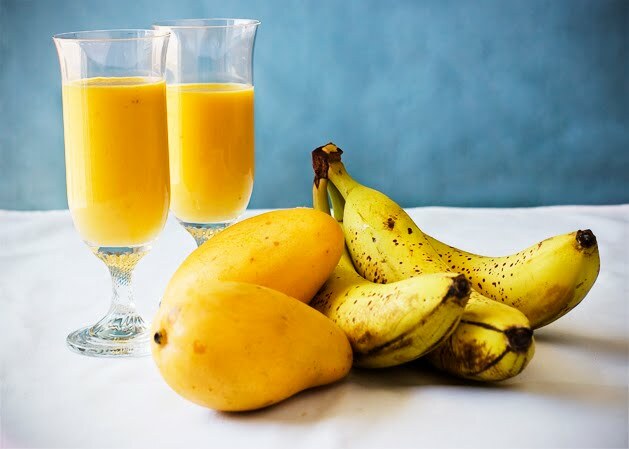 As for the drink, mango is sweet and aromatic, with a hint of banana and milk, this drink needs no sugar if all the fruit are ripe. And, it takes just a few seconds to whip up. Rehydrate tamarind paste by soaking it in 3/4 cup boiling water for about 10 mins. Strain it through a strainer, pushing the pulp fibers to squeeze out the juice. Mix fish sauce, rice vinegar, sugar and 2 Tbsp oil with the tamarind extract. Set it aside. Beat eggs with 1/8 tsp salt in a small bowl. Set aside. Heat 1 Tbsp oil in a 12" skillet over high heat until hot but not smoking, about 2 mins. Add shrimps and sprinkle 1/8 tsp salt on the shrimps. Cook, toss occasionally, until shrimps turned pink and opaque with brown edges, about 2 to 3 mins. Remove the shrimps and set aside. Add 1 Tbsp oil to skillet. Add garlic, shallot and chili pepper. Cook over medium heat, stir continuously, until fragrant, about 1 min, add eggs to skillet and stir vigorously with wooden spoon until scrambled and barely moist, about 20 sec. Add noodles, dried shrimps, toss with tong or 2 wooden spoons to combine. Pour fish sauce mixture over noodles, increase heat to high, and continue to toss all the ingredients with the sauce. 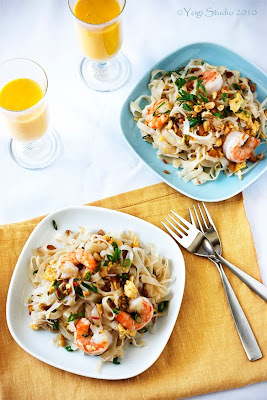 Add 1/4 cup peanuts, bean sprouts, all but 1/4 cup scallions, and cooked shrimps over noodles. Continue to cook and toss, until noodles are tender. , about 2 mins. Dish out the noodles. Sprinkle remaining peanuts, scallions and cilantro on top. Serve immediately. The tamarind paste I bought came in a plastic package and was marked "Product of Thailand". You can buy it in most Asian stores. If you cannot find tamarind paste, you can substitute it with 1/3 cup lime juice according to Cook's Illustrated although I never tried this before. The tamarind gives the dish a distinct sour flavor that I think is hard to replace with any substitution. The rice stick I used was also came from Thailand. They came in S, M, and L size. I use M most of the time, but this time I used L which is about 1/4" wide. In the original recipe, 3/4 tsp of cayenne pepper is used in place of the thai chili pepper. You can add the cayenne to the fish sauce mixture if using. Coarsely chopped mango and banana. Add milk. Process with a regular or hand held blender until smooth. Adjust consistency with amount of milk. You can start with 1 cup milk first and add more if you want the drink to be less thick. came here from foodgawker, fabulous looking pad thai! what a beautiful, cheerful photo. great recipe too, love tamarind. will definitely be giving this a try! This looks delicious! 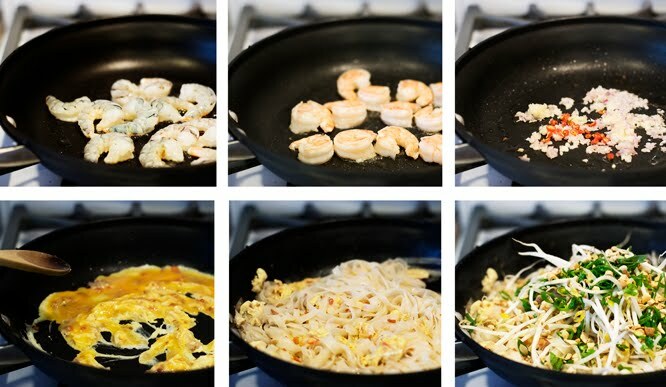 Love pad thai and should start making it at home. Tamarind makes for a refreshing drink too diluted in some water and with a little sugar and maybe spices. arundati - Thank you for stopping by. Zested - I was actually inspired by your pictures to take these ones. Your pictures are always very colorful and attractive. Xiaolu - Tamarind drink seems to be a good idea. I will certainly try that out. **SWOON** I've been craving pad thai like nobody's business. Bookmarking this for an under-eighty day! I made this a while ago but forgot to comment. Thanks so much for a great recipe! I added just a little more lime at the end for my own tastes... I knew Pad Thai was delicious, but I never knew it could be SO easy to make. The only thing I was wondering about was how much bean sprouts to add.... I added about a handful and it seemed to work out fine.